Lowrance is a leading manufacturer when it comes to marine electronics. It designed and produced the first consumer sonar in the late 1950s. Ever since their first foray into the market, they've been making innovations and new products each year. They have lots of history behind them, and lots of great devices. We have had the pleasure to work with many of their units over the years. That's why we are going to review their fish finder named the Elite-3X Fish finder which has an 83/200 kHz Transducer. This product is an affordable option for everyone looking to get their hands on a decent unit. It's a good choice for a back-up or as a fish finder﻿ for beginners. It comes in a compact size and with a broadband sounder sonar. This unit identifies different contours and fish with precision. Besides that, it comes with a few added features like a water temperature sensor. It doesn't come with all the bells and whistles like GPS, but it's a good basic unit and doesn't cost a whole lot. It should be on the top of your list if it falls into your price range for a fish finder. 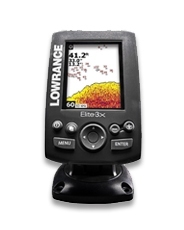 The Elite 3X fish finder comes with a 3.5 inch LCD screen that has wide viewing angles. It has 256 colors and provides a lot of detail, especially considering the low price of this device. The screen resolution is 320 x 240 which is more than enough for the information it displays. The readings don't appear cluttered, and you can see everything in a clear way. During nighttime or when visibility is low, there's a white LED backlight to help you see sonar readings. In comparison, the screen could be brighter for use under direct sunlight. You might have trouble viewing all the information on the display sometimes. To control the backlight, you can use the unit's power button. There are 11 different backlight levels to choose from to accommodate different weather conditions. In general, the menus and different buttons are intuitive, even for first-time users of fish finders. With quick keys underneath the screen, you can adjust the Elite 3X in a matter of seconds. Dedicated keys reduce the time necessary to manage different settings. You can zoom in and get a better look at areas of interest, or quickly switch between different frequencies. 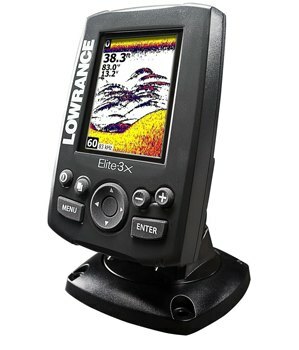 If you want a fish finder but have limited real estate on your boat, then the Elite 3X is a good choice. Thanks to its 3.5-inch screen size, it's compact. It's ideal for use when each bit of space matters. That's why we can recommend it for small boats, kayaks, and similar size vessels. This unit operates with a dual frequency of 83/200 kHz. It has a broadband sounder transducer that provides visualization of everything beneath your boat or in the water. The 83 kHz and a 60° cone-shaped beam help scan larger areas. On the other hand, the 200 kHz sonar adds 20° of coverage that is suitable for creating vertical displays and differentiating between various solid objects. This 20° beam is ideal for tracking of lures of fish targets. In essence, dual frequency operation provides you with two fish finders. These frequencies are ideal for freshwater, and some use in shallow saltwater. The patented skimmer transducer technology gives this unit the ability to measure water temperature. Also, it can perform successful bottom-tracking at speeds of up to 75 mph. By using the Advanced Signal Process function ( ASP ), there's less need for manual setup. With this type of processing, this fish finder displays fish, structures and bottom detail with more clarity. ASP saves valuable time and is useful to people who like a plug and play device. Fish ID is a unique feature that helps beginners with the interpretation of sonar readings. Instead of fish arches, it displays fish targets in the form of different icons. That way you don't have to wonder if what you are seeing is, in fact, a fish. This function includes alarm and track options. For manual settings, you can use the menu button. It has options for changing range, consistency, sensitivity, ping speed, fish ID, etc. The menus are straightforward and easy to understand, so you should have no trouble navigating through them. If you want, you can even adjust what will be on the screen. This fish finder comes with a mount that makes installing and taking it off a quick process. You can also tilt to adjust this unit according to your needs. That way you can always find the right angle.